It was 10 years ago when I first discussed with Howard Olansky, the co-founder of ICS Cleaning Specialist, the idea of doing a column on rug cleaning. He gave me the green light, and I appreciate your interest in reading “The Rug Cleaning Specialist” during the past decade. At the time I first started this column, area rug sales were about 10 percent of the total soft floor covering market. According to a more recent study published in 2004, area rugs comprised 17.6 percent of the total market. It seems the demand for hard surfaces in homes is still on the rise. As a result, sales of area rugs will continue to grow. If you are not offering area rug cleaning, it will become harder to expand the wall-to-wall carpet-cleaning portion of your business. It is now easy to find good, detailed rug training programs. To become a real expert can take years, but a well-rounded training program will give you the basics to get started and help you avoid major problems. Well, it is time for a pop quiz to see if you have remembered some of the information from the past 10 years. The answers can be found at the end of the article (no cheating). 1. What are the foundation yarns in a hand-knotted and machine-made rug called? 2. Should one look at the front or the back of a rug to see how it is constructed? 3. What is the key item to look for when determining if the rug is machine-made? 4. 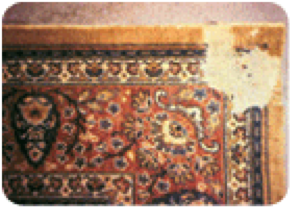 Which of these two photographs illustrates a machine-made rug? 5. What is the construction of the rug shown here? 6. 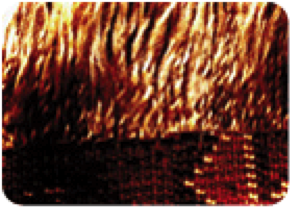 We do not see the continuous warps on a hand-knotted rug, but what foundation yarn do we see here? 7. What is the most important step in the rug cleaning process? 8. 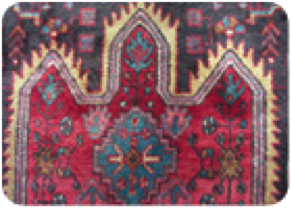 What has been the pH guideline for rug cleaning chemicals over the years? 9. Why is this guideline not reliable? 10. What is the result when cleaning a rug using products containing buffering agents? 11. What independent organization tests products as safe to use on wool? 12. What does the symbol ‘pH’ mean? 13. What has happened to the rug shown here? 14. Are mothballs an effective control of rug moth infestation? 15. 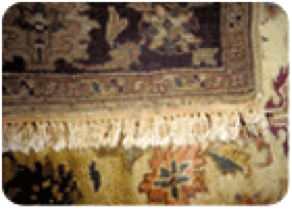 What are the two most common rug repairs customers request? 16. Is the fringe of a hand-knotted rug the end of the wefts? 17. What is the construction of the rug shown here? 18. 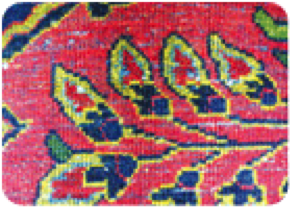 What is the fiber content of the fringe in the tribal rug shown here? 19. When looking for a rug appraiser, membership in what appraisal society is a must? 20. Wool can hold what percent of its weight in moisture and still feel dry to the touch? 21. What is the construction of the rug shown here, and the safest cleaning method for it? 22. Why is a complete dusting of a wool rug necessary? 23. What is the color change called on the rug shown here? 24. This rug has what problem that must be noted on the pre-cleaning inspection report? 25. Why is the fringe on this rug discolored (hint: it is not browning)? 26. 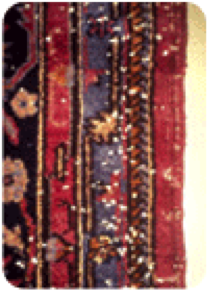 What are two problems that may be encountered in cleaning hand-tufted rugs from China and India? 27. Identify the origin of this rug. If you got 95 percent or more right, go to the head of the class. If not, you may want to look into one of the rug training classes. Remember, your best marketing tool is your knowledge. 3. The fine continuous line of the warps running the length of the rug. 7. Pre-cleaning inspection of the rug. 9. Buffering agents (alkaline builders) cause a pH shift in a wool rug. 15. Ends (fringe) and sides. 19. International Society of Appraisers (ISA). 21. Wilton border rug; absorbent compound, to prevent shrinkage. 22. Wool has the ability to hold more dry soil than man-made fibers. 25. 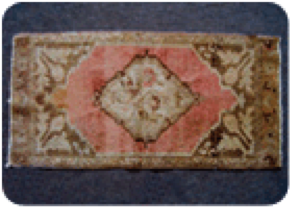 The rug was “tea washed” or antiqued with a yellow dye that leaves the fringe blotchy after cleaning. 26. 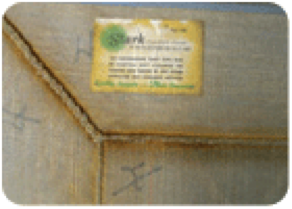 Dye bleeding, browning, stencil marks bleeding to the surface, delamination of the secondary backing and odor of uncured latex.